In the therapy clinic, Multiple Sclerosis (MS) can be a challenging and difficult chronic disease with a wide range of variable symptoms to treat. Within American Occupational Therapy Association’s Practice Framework, MS can impact several occupations including activities of daily living, instrumental activities of daily living, work, leisure, sleep, and social participation depending on impairments. What can we, as occupational therapy practitioners, do to encourage and facilitate appropriate care and treatment for our patients with MS? While healthcare for chronic diseases is a difficult topic, there are five immediate tactics occupational therapy practitioners can do to help their patients with MS: advocate for early intervention, assess workplace environments, design interventions to address fatigue, provide holistic treatment, and suggest additional resources for both patients and caregivers to promote improved quality of life. MS is a disabling, progressive disease of the central nervous system, causing a variety of physical, cognitive, and psychosocial impairments for individuals diagnosed with this condition. Interestingly, it is most commonly diagnosed between the ages of 20 and 50, making MS, in fact, the most common cause of neurological dysfunction in young adults (Beer, Khan & Kesselring, 2012). The wide variety of impairments may include everything from movement disorder, fatigue, bladder and bowel dysfunction, cognitive impairment, depression, visual disorder, to dysphagia. These impairments can negatively impact occupations and quality of life. This disease also follows an unpredictable course. Due to the disabling, unpredictable nature of the disease and the commonality of a diagnosis at a young age, I feel it is imperative patients receive access to early therapeutic intervention. The unfortunate news in literature, however, suggests that over 50% of individuals with MS are reporting unmet non-pharmacological needs. This includes access to/participation in occupational therapy, speech therapy, physical therapy, financial support, equipment education, employment opportunities, and caregiver assistance (Lonergan, et al., 2015). First, advocate for a proactive therapy approach beginning at initial diagnosis and continuing throughout your patient’s life. When patients receive a therapy evaluation at initial diagnosis, we should make sure to provide them with resources, education, and support. This could go a long way towards easing the emotional turmoil a patient may experience when first receiving this diagnosis, and it might better help them prepare for their future. Access to early intervention reduces risks of losing independence and assists in maintaining functional capacities. In fact, research has actually found benefits from rehabilitation interventions are higher in earlier stages of MS (Beer et al., 2012). 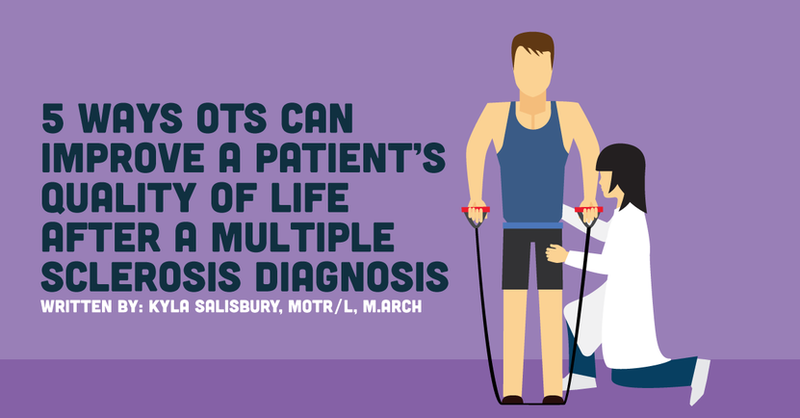 Throughout their lifespan, patients with MS should be regularly evaluated and assessed. Therapy interventions will evolve with time to address your patient’s progressing needs, deficits, and goals. Let physicians in your area know you are available and able to help a patient with MS at initial diagnosis and throughout their care. Researchers, Rumrill, Roessler, Vierstra, Hennessey & Staples (2004) support early intervention within workplace environments to reduce barriers and enhance job satisfaction and tenure. In workplace assessments, therapy assistance may best be provided on a single or short-term basis. If long-term therapy is needed, referral to a vocational rehabilitation specialist would be best practice. To help your patient with MS, it may be necessary to complete job/task analyses, recommend accommodations, educate on self-advocacy, and/or facilitate employee-employer negotiation. Some sample accommodations may be as follows: cool work environment, sedentary work, easy access to restrooms, adapted equipment, flexible schedule/hours, and/or scheduling frequent bathroom breaks. Between 78% and 90% of all individuals with MS are affected by fatigue (Welham, 1995). Because of this, patients may be apprehensive to engage in exercise. Rest and activity avoidance, however, contributes to decreased cardiovascular output, deconditioning, and consequently adds to fatigue (Smith, 2006). Assess the appropriateness of a gentle progressive resistance exercise program for your patient with MS. Also train them on modified approaches for self cares: adaptive equipment, durable medical equipment, energy conservation strategies, activity simplification, and compensatory strategies. When training compensatory strategies for your patients with cognitive deficits remember this key concept: self-generated task steps have better recall and performance than steps merely provided to patient (Yu & Mathiowetz, 2013). Also, consider environmental modifications including temperature control and decreasing clutter. Decreasing clutter will also decrease risk for falls. Depression occurs in 15% to 47% of patients with MS. Depression is more frequent at disease onset. Additionally, women have been found to have greater anxiety in addition to symptoms of depression. To address these concerns, work to improve your patient’s internal sense of control. To improve their sense of control, educate on transportation options, resources, and support groups. Plan for future changes in function and train on adaptive equipment early to improve patient safety. Consider implementing principles of cognitive behavioral therapy into practice. Cognitive behavior therapy is a type of psychotherapy in which negative patterns of thought about the self and the world are challenged in order to alter unwanted behavior patterns or treat mood disorders. Relaxation training, stress management, and mindfulness training are also important to incorporate into therapy practice. Research by Falk-Kessler, Kalina & Miller (2012) found occupational therapy has the ability to positively impact the characteristic of resilience in patients with MS. The National Multiple Sclerosis Society (http://www.nationalmssociety.org) offers information, resources, support, and ways to get involved. Research your local community for support groups and community events. Search online for e-communities and discussion forums for patient support. Suggest your patients track their symptoms and factors affecting their symptoms with an application such as My Sidekick for MS or Symple Symptom Tracker. My Sidekick for MS is available for Apple and Android and offers the ability to record and track mood, energy level, activities, sensations, and memory over time. Symple Symptom Tracker is available for Apple and can be used to track several symptoms and factors on a daily and monthly basis. Data can be easily forwarded to health care professionals to assist patients with monitoring well-being and meds. Considering the progressive disabling nature of MS and the impact on function and quality of life for such a young patient population, it is imperative patients receive early access to therapy. The primary goals for therapy should include improving quality of life, increasing participation in roles and occupations, and improving function, safety, and independence for your patients. With these suggestions, you’ll be able to meet these goals and see your patients quality of life improve for the better. Have more to treatment interventions or ideas to share? Comment below. Let’s be a community supporting the change for the better for our patients with Multiple Sclerosis!